Well, there’s a movie out this weekend that’s based on the toy. I got to see the press screening last weekend with Wamalug (the Washington Metropolitan Area LEGO Users Group), so I’m here to give you my review. I’m no stranger to Lego-based movies. In fact, my friends and I used to do a lot of stop-motion animation with Lego parts before college and, well, life started interfering. We even created what might still hold the record as the longest brickfilm (a stop-motion film using Lego bricks), a 75-minute Star Wars parody, Episode √2: The Great Disturbance, back in 2004. 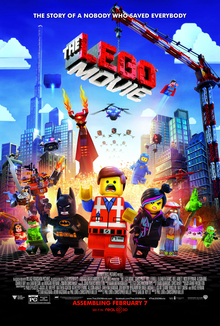 I go through that not to promote work a decade old but rather to show what I consider a proper Lego movie. Namely, a movie that uses actual Lego. So I haven’t been interested in any of the Lego video games; I have trouble even using a CAD program to design models in order to figure out what parts I need to order to complete my masterpiece. It’s just not the same when it’s not the real brick. So you can imagine that I’m not too impressed with a Lego film that uses computer-generated graphics. I’ve seen the animation. Come on. And if you’re producing cartoons that don’t actually use the conceit of recombining bricks, what’s the point of using the Lego brand? It doesn’t even make a proper commercial for the sets, so just go with a normal cartoon style and leggo my Lego. And that brings us to The LEGO Movie. I saw the trailers. I wasn’t impressed. It seemed to do a better job of displaying the capabilities of the toy, but . . . well, it just seemed dumb. So I went into the theater expecting to be bored. This is where I have to pause, though, for ethical reasons. I was given free merchandise, and the press screening was complimentary. None of these were given as an incentive for this review, but they were implicitly expecting me to promote the movie. However, I never give a good review if I don’t actually believe in it. (This has come up before.) And I was never told to only say good things; if I didn’t like it, I wouldn’t have praised it on live TV. There are plenty of grade-school level jokes in there, but there are some great moments for adults. And if you’re an adult builder — wow! There are some great little bits in there just for us. This was clearly written by people who understand the brick as well as the art. And the animation is not only careful to stick (most of the time) to the actual capabilities of the real bricks, but is actually so well done that at the start of the film I did a double-take because I thought it was the real thing. Unlike the Disney animations, this specifically uses — even celebrates — the concept of combining bricks. This isn’t animation based on a toy line like G. I. Joe or Transformers; this brings Lego to life. Seriously, I had to look closely at this scene. Even the reflections are accurate! But it doesn’t stop there; it goes on to have not just one but two messages, delivered so well that they don’t even feel preachy (and I’ve got a low tolerance for preachy entertainment). The first message is about creativity, and uses the medium of Lego to illustrate it in a near-perfect manner. The main character, Emmet, has to learn to move beyond the instructions that have governed his life and build from his own imagination, learning to see the parts around him as vehicles for ingenuity. It’s a clear reference to taking the step beyond the individual Lego sets and making your own creations, but teased out with character growth and humor that it inspires the audience rather than lecturing at them. The fate of the universe rests on this guy’s creativity. We are so doomed. The second message is an even trickier one, that many stories have tried to tackle over the years: What does it take to be “special”? It’s not an absolutely perfect attempt, but it comes close enough for me to be pleased. I won’t give away what happens, but the audience isn’t just given a wishy-washy “everyone is special in their own way” message. Instead, we’re told to take that extra step to take action, and not ignore our talents. Some of you, mainly those who are experienced with setup/payoff techniques, will find this next bit to be a spoiler, just because of what I’m talking about. So if you want to go in completely unspoiled — and it’s worth it — come back and finish this later. Don’t believe me? Watch the movie. Tell me where I’m wrong. Tolkien echoes this in his more famous essay decades later, “On Fairy Stories” (which I haven’t done a blog post on but totally should). In The LEGO Movie, we find a story within a story, and it uses the twin messages of creativity and the nature of being special to perfectly illustrate what Chesterton and Tolkien wrote about so long ago. Stories are a method for us to sit back, marvel at the fiction, and then realize that there are fantastic marvels to be had even closer to home — if only we can shake off the ordinary and realize the world is extraordinary. I absolutely, highly, and unreservedly recommend this movie. I don’t care if you don’t like Lego (and why not!?) — just go see it. Round up your kids, your siblings’ kids, the neighbors’ kids, or random street urchins if you feel the need for camouflage, but go see it. They’ll enjoy it, and so will you. « So Ninjas DO Show Up on TV!